Instagram is my preferred social platform at the moment. 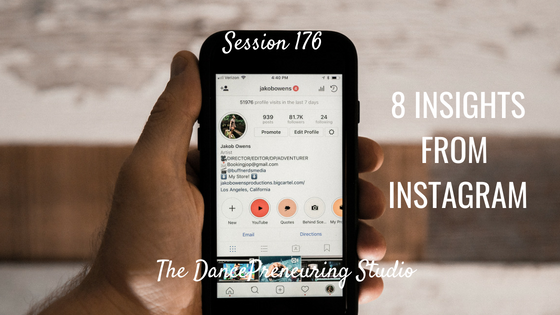 I have learned a few things in my experience with Instagram and I share 8 insights that can help you navigate the content you create and consume. Step to Success: A step to your success is anything that moves your life and your business forward. Whether it’s an app, a book or an idea, you can apply something today that can help you succeed. Today’s step to success is analyzing what is costing you to NOT do something. I talk about a conversation I overheard about exercise as an example. 1. Determine what goals you want from this platform, or any platform. Is it to share your personal life, your business brand? Ask questions? Do research? 2. Be aware that there is a follow/unfollow game going on. 3. Aesthetic isn’t everything. I follow accounts because I like them, not because they look pretty or there’s a proper ratio of images, videos and infographics. 4. Pay attention to what people resonate with. 6. Stop playing the victim card. 7. You don’t own the platform so if you’re looking for building long term relationships, take it elsewhere. 8. Ignorance can be bliss, so if the above 7 don’t resonate with you, disregard.